Airline passengers are not getting smarter. This week's attempts by two men to board airplanes at Philadelphia International Airport with fireworks and firearms were not unusual events. In fact, they're getting more common all the time. Last year 1,310 guns - about 3.5 a day - were seized by airport screeners across the nation. That's up from 1,123 in 2010 and 851 in 2005. "Despite our best efforts, the numbers are going up every year," said Ann Davis, a Transportation Security Administration (TSA) spokeswoman. On Friday, one of the men arrested the day before at Philadelphia International, Joseph Picklo, 29, of Dallas, Pa., was ordered by a federal magistrate to remain jailed until a bail hearing Tuesday. Assistant U.S. Attorney Anthony Wzorek said "further investigation" was needed before the government could agree to bail for Picklo, who was arrested Thursday morning. A TSA baggage screener found fireworks, a "powdery mixture," a plastic bottle wrapped with electrical tape, a wick and a cigarette lighter in his backpack. A second man, Matthew Kesner, 42, of Phoenixville, was arrested Thursday night at the airport after a .25-caliber pistol was found in a carry-on bag. The arrests were similar to those made daily at U.S. airports. Last week, 29 guns, 21 of them loaded, were found in carry-on luggage of passengers attempting to board planes. Most of the passengers used the excuse that TSA screeners hear most often: "I forgot." "The vast majority of passengers indicate they simply forgot the item was in their luggage," Davis said. Sometimes, passengers clearly knew what they were doing. Like the guy in Jacksonville who tried to disguise his real gun as a toy gun. He put the real gun in a toy police-officer kit. To complete the subterfuge, he stuck a dart in the barrel. He still got caught. But guns and fireworks are downright boring compared to what some passengers try to take on planes. A stun gun disguised as a smartphone was found at Los Angeles International, a flare gun with seven flares was found at Norfolk, two throwing knives were concealed in a hollowed-out book at Washington National, and land mines (determined to be not in working order) were found at Salt Lake City, according to the TSA's blogger, Bob Burns, in his "top 10 good catches of 2011" post. An bomb expert caught the TSA's attention when he packed a training tool - a fake bomb - in his carry-on. Nine model rocket engines were discovered in checked baggage at Cape Girardeau, Missouri. One passenger in Palm Beach had these items in his carry-on: Stun gun, double-edged dagger, box cutter, package of razor blades, shotgun shell, three loose rounds of ammo, and two M-5000 firecrackers. He did not make his flight. 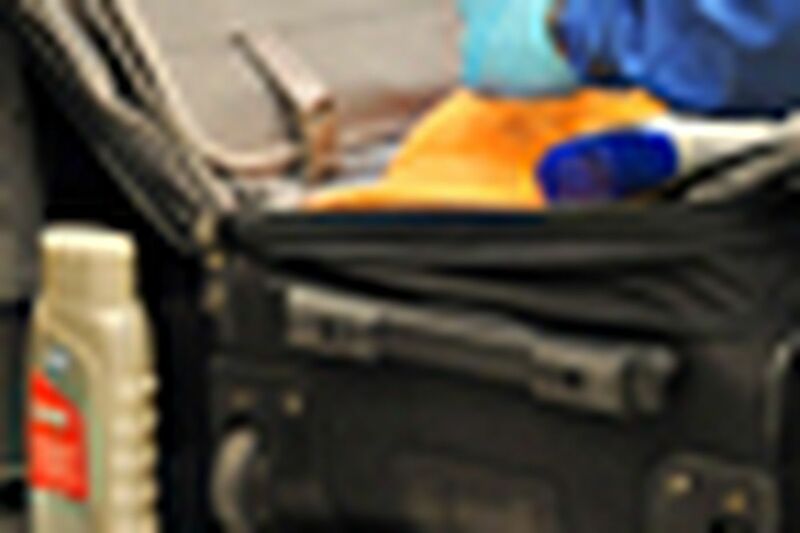 Then there was the passenger in San Francisco who tried to check in his luggage an automobile air bag, with its explosive actuator clearly labeled "EXPLOSIVE." Sometimes it's not the items that people try to bring on planes that get them in trouble. Sometimes, it's what they say. A passenger in San Juan became disruptive during screening and told agents: "I have a bomb, but I disarmed it." Actually, it's not illegal to bring an unloaded gun onto a plane if you first declare it to the airline and it's packed in a locked box in your checked luggage. In addition to criminal charges from local or federal law-enforcement officers, passengers also can face civil penalties from the TSA. Davis said TSA officials were still investigating the two recent Philadelphia incidents to determine if the agency will seek to impose civil penalties. She said she could not explain why so many would-be fliers try to bring forbidden items onto planes. "It's not for us to explain," she said. "We just have to be prepared." Daily News staff writer Michael Hinkelman contributed to this article.